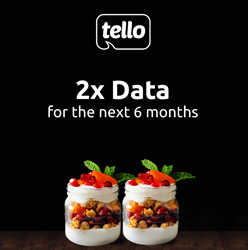 When joining Tello, the new customers get double data for the first 6 months. Holiday season ended and most probably, along with people’s savings. But Tello has their back and keeps the spirits merry and bright by launching a new deal. When joining Tello, the new customers get double data for the first 6 months.The offer is valid for any plan between 200MB - 10GB, starting January 10 until January 16. The offer is open to all those hooked on savings, always looking for new ways to manage better their budgets, who aren’t Tello customers yet. In order to switch to Tello, people can bring their own device or choose one from Tello’s offer. If the customer’s phone uses a CDMA SIM, they need to enter the SIM number and click ‘Check’. Last porting step: enter the phone number. They also have the option to get a new phone number from Tello during the porting process. For any additional information customers may need, Tello’s Customer Support is available 24/7. In this context of a continuing rise of data consumption, Tello Mobile offer is even more appealing, since it can be translated into huge savings. the $19 plan will offer unlimited talk & text and 4GB (2GB from the standard plan and 2GB for free). the $29 plan will offer unlimited talk & text and 8GB (4GB from the standard plan and 4GB for free). the $39 plan will offer unlimited talk & text and 20GB (10GB from the standard plan and 10GB for free). Why should people join Tello? Besides the amazing data offer, people interested in saving money on their phone bills have many reasons to join Tello. Customers can choose the amount of minutes & data they need and unlimited texts are included in every plan, free of charge. Phone plans are as low as $5/mo. up to $39/mo. Cell phone plans can be upgraded, downgraded, or renewed at any time, for no charge at all. The “no fees whatsoever” policy, outstanding 24/7 customer service & free calls to Canada, Mexico & China included in any plan make Tello stand out from other MVNOs. Other great freebies: tethering, unlimited text, voicemail. Besides being flexible when it comes to plans, Tello is also the only wireless carrier rated as ‘Excellent’, as a result of more than 3800 reviews from its customers on Trustpilot, a famous review website getting roughly 500,000 genuine testimonials about thousands of businesses each month. Tello is a telecom provider operating on the US market. Tello.com is a KeepCalling brand, a global telecommunications company registered in 2002 in USA. Presently, KeepCalling provides its services to hundreds of thousands of consumers, with a focus on customer satisfaction. KeepCalling was listed by Inc 5000 as one of the fastest growing companies in the USA for 5 consecutive years.